This rotating light is maintenance free because no mechanically moving parts are needed and the lamp is replaced by LEDs. Unnecessary light emissions are avoided as only the required direction segments are illuminated. Blinding at night or at dusk is avoided by the external light-dependent LED brightness. 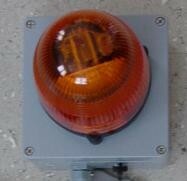 Rotary light / warning light, are illuminated in both one and a plurality of adjustable angle.